I thought it was all supposed to burn up and explode. Did some of it fall into the ocean? Some of the other satellites that crashed back to Earth had some toxic materials survive. Naturally, they will SAY it all burned up.....but who knows? A mysterious unidentified falling object has crash landed in Brazil, and video of the object has been uploaded online. The sphere's original purpose is unknown, but it appears to have been crafted artificially. And it's deeply scored with burns and abrasions that appear to have been caused during its fall. Was this object dropped from space by an accident? And could it be related to the recently destroyed Phobos Grunt? Or is it something else entirely? Shortly after the object descended from the sky it was swarmed by some twenty villagers from nearby. By the time authorities arrived, an estimated 2,000 people from the surrounding Maranhao area had gathered to examine the mysterious piece of debris from the sky. After news of the object became more widespread, soon Brazilian authorities arrived and took the object to a barracks in Matta Roma. Without the proper equipment to analyze the device, they do not know what it might be. If it's from a satellite, it will be difficult to determine without knowing which one it could have come from. Video of the object being handled by locals has been uploaded to Youtube. One of the interesting parts of the object is the nozzle at the end visible at the 1:18 mark. It almost looks as though it has a faucet handle like those seen on deep sea diving suits, or would be threaded to another piece of equipment. At the same time, this part of the object is too badly burned to positively identify what it is meant for. While the mystery is by no means solved, there are a number of people looking into it that suggest it may be related to the recent reentry of Russia's Fobos Grunt. While the Russian military Air and Space Defense Forces stated that the probe reentered the atmosphere and plummeted somewhere in the Pacific Ocean, previous concerns suggested that it could have reached much closer to Argentina. While the Grunt was never actually seen reentering or crashing into the ocean, calculations published by the Russian authorities said it would be safe. Civilian Ballistic experts, suggested that fragments of the object could have spread out, well into Brazil - including where the mystery object was found. An UN-identified metal sphere has plunged from the sky on unsuspecting villagers in northern Brazil, causing an uproar. According to eyewitnesses, the UFO weighs about 50 kilograms and measures roughly one meter in diameter. The noise was such that Mendes was too scared to go outside. However, curiosity got the better of him and he headed outside to find the cashew tree's trunk snapped in half by a mysterious metal sphere lying in a hole nearby. Some 20 villagers joined Mendes to help him extract the object from the ground and examine it. Mendes says the sphere is hollow and if shaken some sort of liquid can be felt swishing inside. Locals quickly spread the news, as they reached the town of Mata Roma over 2,000 people flocked to see the "UFO". "It was a huge uproar here. Some feared it was the beginning of the 2012 end of the world, others said it was 'alien', but I think it is a piece of satellite," said Max Garreto Mauro, 25, a resident of Mata Roma. Military police confiscated the sphere and took it to the barracks in the nearby Mata Roma. They have not specified what the UFO's possible future will be. In a statement the Air Force Command said it "does not have specialized structures to perform scientific research on this type of aerial phenomena, which prevents the institution to submit an opinion on these events." In December 2011, a similar incident happened in Namibia, where a metal "Teletubby head" weighing 5.9 kilograms and measuring 35 centimeters in diameter hit the ground in the village of Omanatunga. Some Russian specialists believe the "head" was part of the third stage of the Soyuz-U rocket, launched on October 30. 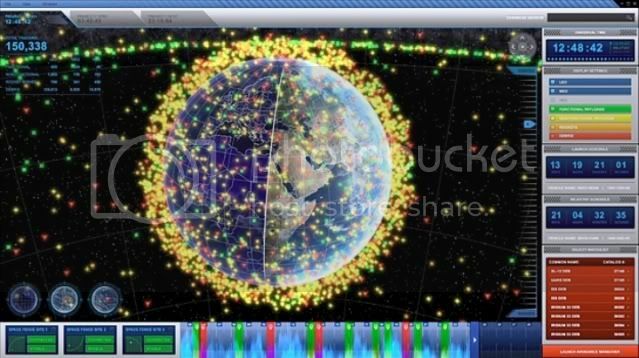 Space debris stories made the headlines throughout 2011. In January, media chased the infamous Russian mars probe Phobos-Grunt across five oceans to keep up with Russia's space agency, constantly changing the possible impact location. 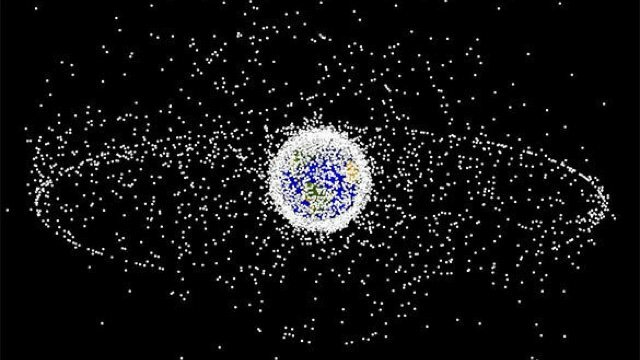 Lockheed Martin says the prototype system it is developing to track all manner of space debris is now tracking actual orbiting space objects. The Space Fence prototype includes new ground-based radars and other technologies to enhance the way the US detects, tracks, measures and catalogs orbiting objects and space debris with improved accuracy, better timeliness and increased surveillance coverage. Lockheed Martin's prototype radar recently met a key contract requirement during a series of demonstration events by proving it could detect these resident space objects, as they are referred to by the Air Force, the company stated. On February 29, the Air Force granted its approval of Lockheed Martin's preliminary design for the system, the company stated. The S-Band Space Fence is part of the Department of Defense's effort to track and detect space objects which can consist of thousands of pieces of space debris as well as commercial and military satellite parts. Approximately 19,000 objects larger than 10 cm are known to exist, according to NASA. The Space Fence will use multiple S-band ground-based radars -- the exact number will depend on operational performance and design considerations -- that will permit uncued detection, tracking and accurate measurement of orbiting space objects. The idea is that the Space Fence is going to be the most precise radar in the space situational surveillance network and The S-band capability will provide the highest accuracy in detecting even the smallest space objects, the Air Force stated. Summary: Autonomous, self-replicating robots could help us explore the Universe, find and identify alien life, and perhaps clean up space debris in the process. [Pin It] Artist's conception of a future mission to deorbit a piece of space junk. What if they were to launch some giant magnets into orbit? As the magnets zoomed around the Earth everything that is magnetic would be attracted to them and then eventually they would fall back to the Earth and disintegrate. I wish they'd hatch a plan to clean up the floating garbage in the ocean. We are sharing the two pictures which Rahul Pandita shared through his twitter account. Nasa will identify it soon as they see it. A STRANGE piece of space junk — appropriately designated WT1190F — has cycled back in its orbit and will topple back to Earth in November. We know it is about 2m long. It seems to be hollow — or at least bent. We know it is on an orbit that lobbed it far beyond the moon. Otherwise, we have no idea what it is — or who put it up there. It’s expected to come crashing back down to Earth about 5pm on November 13 — probably in the Indian Ocean south of Sri Lanka. The baffling bit of metal has caught the attention of Near-Earth Object researchers who are gearing up to watch its re-entry to our atmosphere closely as a means to figure out what it is — and to test the planet’s early warning system for potentially dangerous objects. It’s not often such an entry event can be so accurately predicted. The odd object was discovered in early October by the Catalina Sky Survey — a project intended to provide early warning of approaching comets and asteroids. Initially, astronomers had no idea what the strange moving gleam in their cameras could be. But tracking its trajectory back led to sightings dating back as far as 2012 being uncovered. It could be a spent rocket stage. It could be a piece of panelling from a space mission. It may even date back to the Apollo Moon missions of the 1960s. Astronomers aim to get detailed observations of the object as it burns up in the hope an analysis of the light spectrum produced will give clues as to what it was made of, and therefore originally used for. In just over one week, three mysterious objects have fallen from the sky onto the country's southeast, prompting bomb disposal agents and experts in hazmat suits to rush over as puzzled locals looked on. 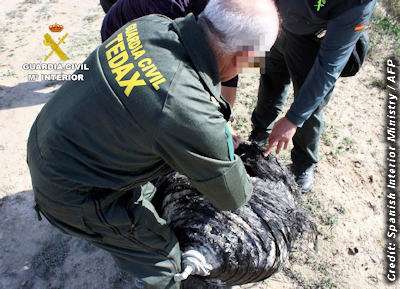 MADRID: It's raining space junk in Spain. Rocket fuel tanks, chunks of satellites or something else entirely ... In just over one week, three mysterious objects have fallen from the sky onto the country's southeast, prompting bomb disposal agents and experts in hazmat suits to rush over as puzzled locals looked on. "Maybe there were just two balls of fire and it looked like there were more ... or some may have fallen in areas where no one goes." "Some measures may have been taken to tackle the problem, but we're far from a solution," it said. 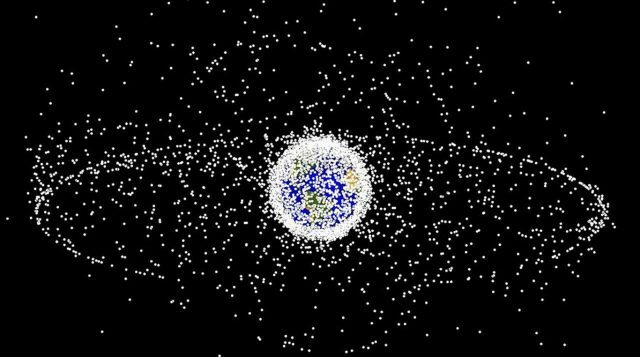 "Not only is it expensive, but it's also difficult to devise a garbage collection system to go sweep in space." When Sputnik IV hit the streets of sleepy Manitowoc, it ushered in the age of space junk. In September 1962, something fell from aloft in Manitowoc, Wisconsin, cracking the asphalt on North 8th Street in front of what’s now the Rahr-West Art Museum. Dennis Gintner, a Manitowoc-area resident, was a pre-teen at the time. He remembers the to-do about it. But as the pieces of the mysterious hunk of metal came to light, the town of Manitowoc realized they were dealing with something that was not of this world. Okay, well, it was only kind of from out of this world. 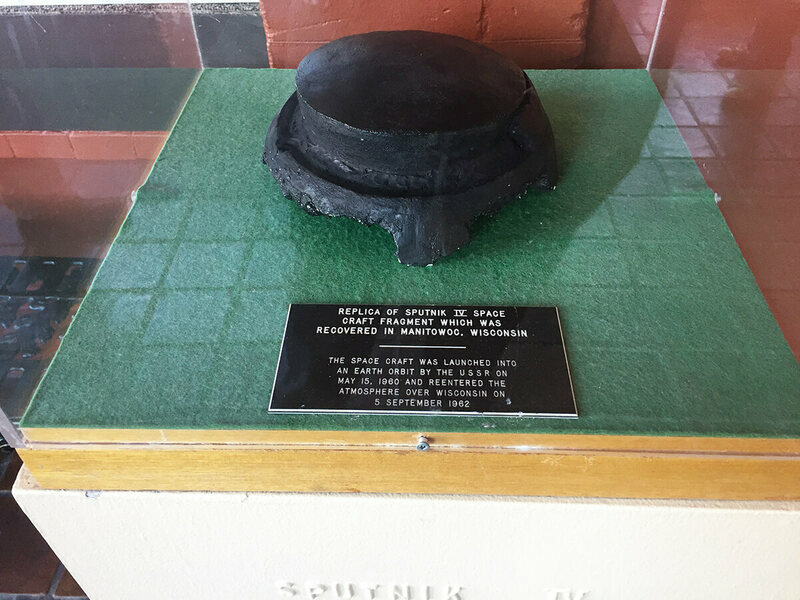 What fell in Manitowoc all of those years ago was a piece of Sputnik IV, a Russian probe that had spent two years in orbit. The Soviets lost control of it not long after its May 1960 launch, and the craft’s low orbit meant it would eventually be dragged down to Earth. “Sputnik IV was a test Vostok spacecraft, which was intended for human spaceflight from the first,” Alice Gorman, a senior lecturer at Flinders University in South Australia, says. “Hence, unlike other Sputnik satellites, it was meant to return to the surface, ideally with its precious humanoid cargo intact. Much of the craft burnt up on the way down, but as it fragmented, some smaller pieces were able to survive the passage through the atmosphere. What returned to Earth was probably fewer than 100 lbs of material out of a total of seven tons. Some fragments likely made it into Lake Michigan. Manitowoc is the only place where a piece seemed to make actual landfall. Jonathan McDowell, an astrophysicist at the Harvard-Smithsonian Center for Astrophysics, says he’s never seen evidence of “anything but the Manitowoc chunk” coming from Sputnik IV. What Gintner said about the cops and the garbage truck is what happened. Two police officers, Marvin Bauch and Ronald Rusboldt, found the object in the middle of the street and ignored it at first. When they came back later, they noticed it was too hot to touch and kicked it aside. As news reports of the craft’s re-entry came about, the police went back to the fragment. Eventually, that fragment made its way into the hands of the Smithsonian, which later returned it to the Russians (somewhat against the will of the Russians, “who called it a circus trick” according to Wisconsin Public Radio.) A replica of the fragment sits in Rahr-West today.